Some people are great at pranks. Others, really aren't. Not everyone can pull off a believable prank call. In fact, sometimes a prank call can end up sounding like a super awkward, unprofessional sales call. It's a tough, uncomfortable world out there for people who want to giggle mischievously but can't bluff to save their life. All the other pranks are prone to injure your pranked loved one either mentally or physically. Enough is enough! Wouldn't it be nice to even the playing field? That's what this not-so-itsy-bitsy spider is here to do! This hairy, multi-legged buddy is over a foot across and is ready to frighten and delight the Halloween revelers in your house. It has eight spidey legs that will move menacingly when you turn it on. It even has red glowing eyes to make it pop in dim lighting. Are you pumped for Halloween? 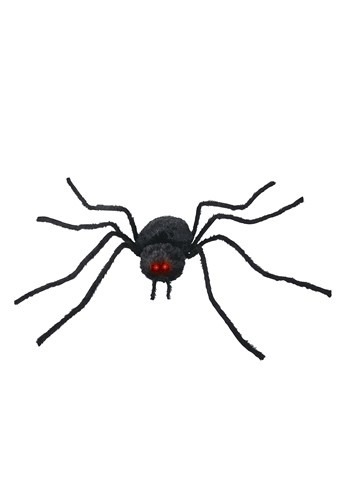 Create a home for this ferocious fierce spider with faux spiderwebs and watch as your home becomes a seasonal haven! Whether you're looking to delight trick-or-treaters or unaware family members, this spider is ready to drop to it! Let's just hoped that the prankee doesn't become the prankster!